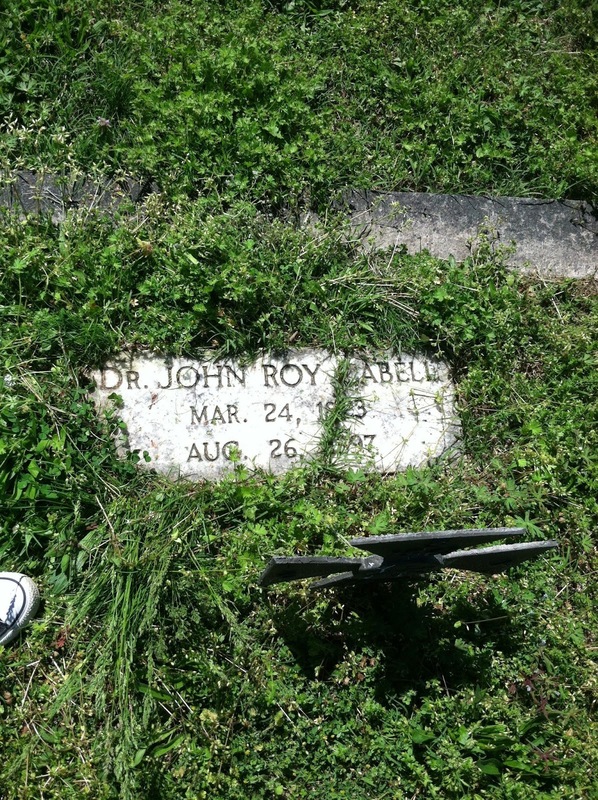 When Dr. John Roy Cabell’s body was committed to the ground at Green Hill Cemetery in 1897, he was 74 years old. 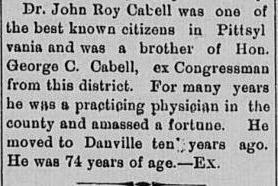 Based on what I’ve read from Green Hill’s Mortuary Reports (1884-1895) and 19th century life expectancies, I feel fairly comfortable in saying that Dr. Cabell lived to a ripe old age. His cause of death wasn’t pneumonia, la grippe, typhoid fever, nervous prostration, consumption, or any of those other mort. report favorites: he was murdered in a particularly gruesome manner. Before we get to that, let’s take a look at John’s life. He was born in 1823 in Pittsylvania County to General Benjamin William Sheridan Cabell and Sarah Epes Doswell Cabell. John was one of eleven children, several of whom he would later serve with during the Civil War. When John’s father died in 1862, the family lived on a prosperous plantation called “Bridgewater,” but I wasn’t able to find anything concrete on the location of the family home. Dr. Cabell married Catherine “Kate” Witcher Clement in February 1861, but the honeymoon would be cut short by the war. In June of that year he was commissioned as a Captain, to serve in Company B, of the Virginia 38th Infantry Regiment where he put his medical training to use on the battlefield. By the time that he was mustered out on 10 Dec 1862, we can only imagine the terrible sights, sounds, smells, and textures he had experienced. The next record I found for John was the 1865 Tax Assessment where he is listed as living in Callands, employed as a physician and surgeon. Kate died on Feb. 10, 1887. Dr. Cabell probably had no idea of the carnage that awaited him on August 26, 1897 when he left his Danville home to confront Edward Hankins, a tenant on one of his Callands plantations. Hankins, described as “brawny” and “powerful,” had served ten years in prison for the 1872 second degree murder of James Jackson, something that Dr. Cabell probably knew because the Jackson affray also took place in Callands. Cabell wasn’t pleased with Hankins’ property management skills and ordered he and his wife had to leave, something that must’ve angered Hankins quite a bit based on the events that followed the eviction notice. Around 8:00 p.m. Dr. Cabell arrived on horseback. Hankins instructed that his wife go to a neighbor’s house for the night, something which would later suggest that he had already planned to murder the elderly physician. 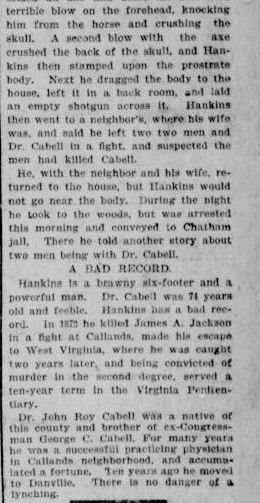 According to news reports, Dr. Cabell asked Hankins when he and his wife were leaving and Hankins answered with an axe blow to Cabell’s head, which knocked him from his horse. Hankins struck Cabell’s skull again and then “stamped upon the prostrate body.” The murdered dragged Cabell inside and through the house, deposited the body in a back room, and placed an empty shotgun across his lifeless corpse. Hankins rushed to the neighbor’s house where he claimed two men had murdered Dr. Cabell. When he, the neighbor, and his wife went back to the Cabell place, Hankins avoided the sight of the elderly man he’d just butchered. He fled into the woods but was arrested the next morning, drunk and still spinning a yarn about two unknown men who’d killed Cabell with knives. Hankins was found guilty of his crime and sentenced to hang in November 1897 in Chatham, Virginia. On his execution day, November 11, he confessed to Dr. Cabell’s murder through a written statement made public after the hanging. 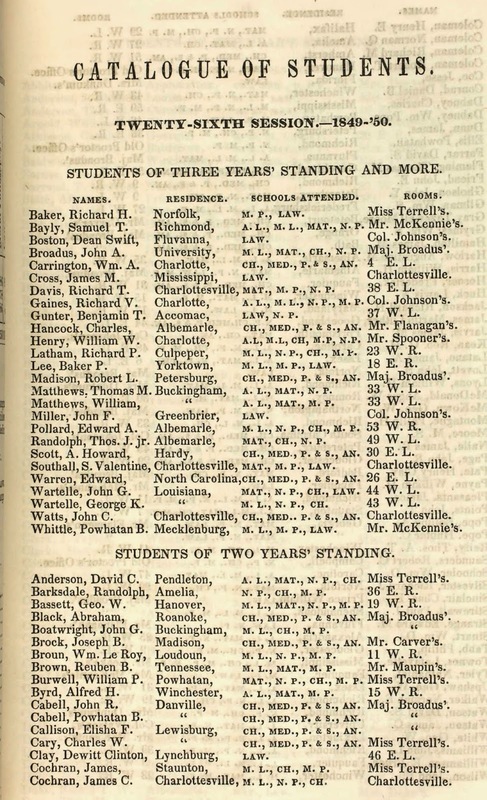 Hankins’ body was sent to the University College of Medicine at Richmond. A detailed account of Hankins’ execution can be read here, which is worth checking out if you’re interested in that sort of thing. Fascinating post. You cannot help but feel sorry for the poor doctor, but why on earth did he employ such a man given his past? I guess we'll never know. Previous Previous post: "The Bier Where Beauty and Grace Lie Cold and Dead"